Blackthorn fruits - sloes - in autumn. 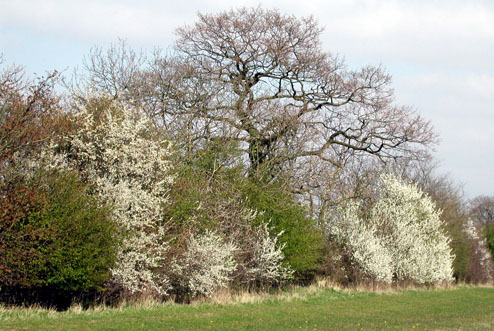 This member of the plum family is, with the hawthorn (whitethorn), a common component of stockproof hedges. Its thorns are longer than those of the hawthorn. It often produces suckers, and it will spread from neglected hedges to form thickets. It grows to 10 or 12 feet in height. The small white five-petalled flowers appear, in short dense spikes, in April, before the leaves open, spectacularly lighting up the hedges in contrast to the dark twiggy growth of the shrub. 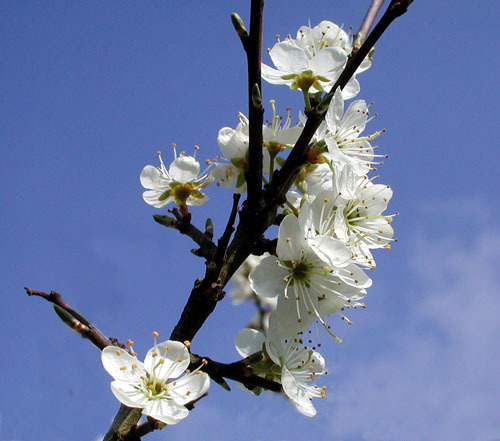 This blossoming often coincides with a cold spell of weather – commonly called a “blackthorn winter” – following a mild false spring. The fruits – sloes – develop in the autumn and take the form of small bluish-black plums. 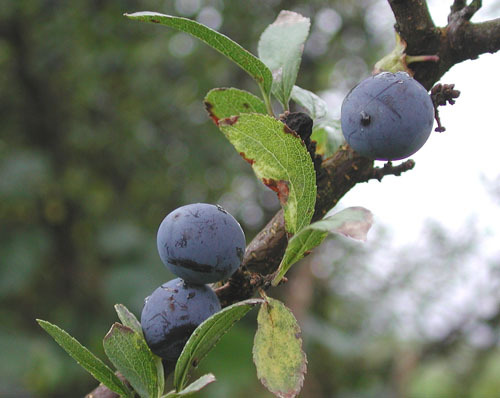 They have a very sharp taste, but are widely used in the making of sloe gin. The fruits are pricked with a skewer and bottled with gin and a little sugar. The resulting liqueur is ready to drink by Christmas, but improves with age. The gin-soaked sloes can be eaten as they are, or coated with chocolate. 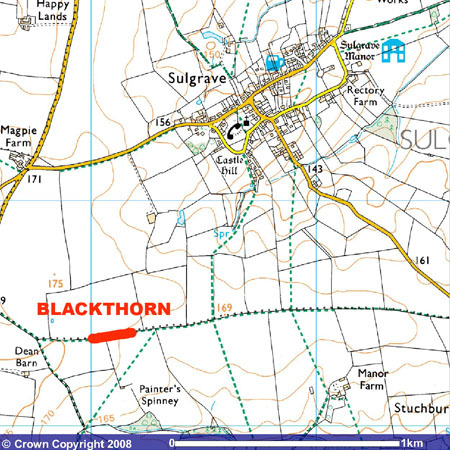 Blackthorn wood is very hard – the thorns are tough enough to puncture tractor tyres – and is used to make walking sticks. Especially prized are “corkscrew” walking sticks, and the Irish shillelaghs were of blackthorn. April - thickets of Blackthorn on the Parish Bounday. Text by George Metcalfe. Photos by Colin Wootton.